How many of you have children or grandchildren obsessed with Disney's Frozen? My 5 year old is one of the masses that has Frozen EVERYTHING. 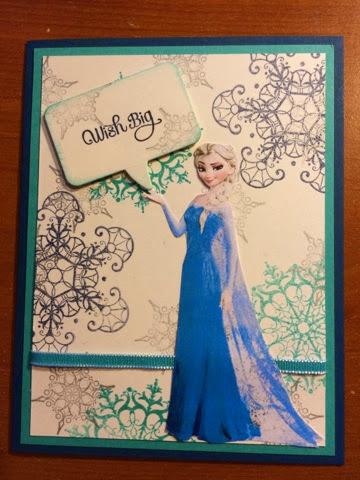 So it was no surprise that she asked me to design a Frozen card to take to her friend's birthday party. I used a retired stamp set, Snowflake Soirée, to create this card. I then printed an image of Elsa that I found online and incorporated her into the card. I topped it off with a "wish big" sentiment from Dozen Thoughts inside a word bubble made with framelits. The card was a hit, and I have a feeling I'll be asked to make a few more versions for future parties.